Fiberglass-reinforced polymer formula producing super durable lighter weigh waste containers with the grand look of architecture stone. StoneTec® will retain its sharp look without fading or discoloration for many years to come. Grab Bag™ System Secures Poly Bag Liners. StoneTec® - Engineered Lightweight Polymer Concrete Formula. Includes Removable Rigid Poly Liner. Use Standard 55 Gallon Trash Bags. Easy lift-off lid helps conceal waste to maintain a clean appearance while curbing any unpleasant odors. Uses standard 55 gallon trash bags and wipes clean with simple soap & water for easy maintenance. 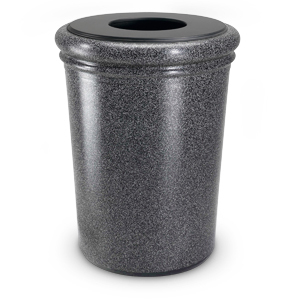 Choose from five popular color options, all containers come with a black open top lid and include rigid poly liner.